This is the tenth in a series of guests posts that feature Archtober Building of the Day tours! For today’s Building of the Day tour, we visited the 2016 AIANY Design Award Winner, Manhattan Districts 1/2/5 Garage and Salt Shed. The Garage and Salt Shed are two separate buildings with specific purposes for the Department of Sanitation. 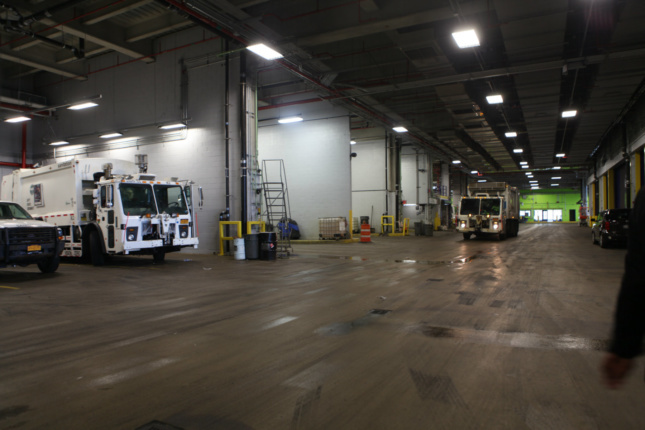 The 425,000 square-foot LEED Gold Certified garage opened in 2015 and houses sanitation trucks from three Manhattan sanitation districts, serving 300,000 residents. Dattner Architects and WXY architecture + urban design worked very closely with the Department of Sanitation, the Public Design Commission, the Department of City Planning, and the Department of Design and Construction to design a building that was functional yet would fit in well with the cityscape. The facade of the building is double skinned, with the interior facade made of glass to allow natural light into the building while the outer façade is composed of 2,600 “fins” made of perforated aluminum. 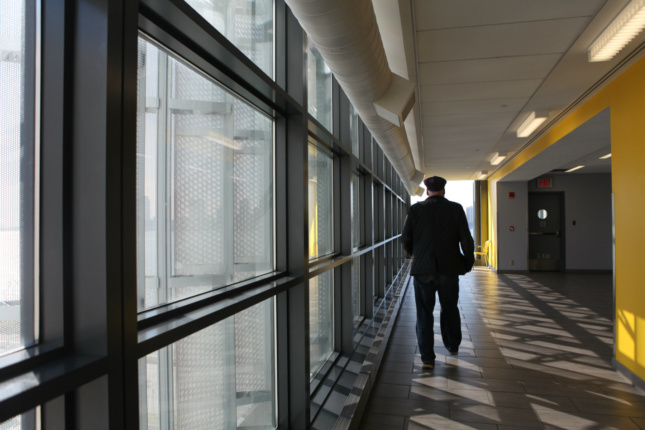 These fins move throughout the day, following the sun to reduce glare inside and keep the temperature pleasant. They also serve the purpose of blocking the headlights and view of the trucks in the garage, which was very important to the neighbors of the garage. Self-sufficiency was a major theme of the construction of the building according to Gia Mainiero, AIA of Dattner Architects. 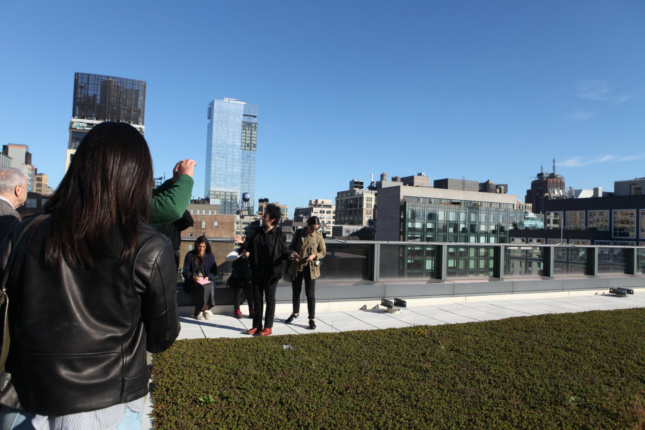 To that effect, the garage has a green roof, the largest in New York City, which helps with energy conservation in the entire building. 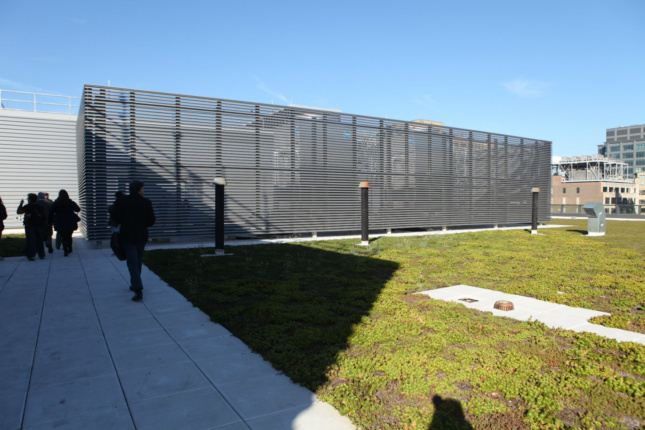 The plants that comprise the green roof are desert succulents, which require little care and no additional watering. The roof also plays a role in the water conservation of the building. 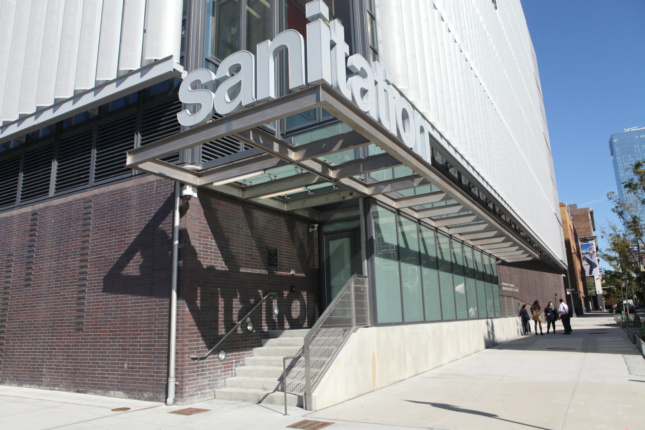 Rainwater from the roof and water created from the Con Ed steam system is collected in a 20,000 gallon tank used to both wash the trucks and supply the building’s sewer system. While the placement of the building was at first controversial, residents are reportedly very pleased with the design of the structure and happy with the fact that it helps keep garbage trucks off the crowded streets. 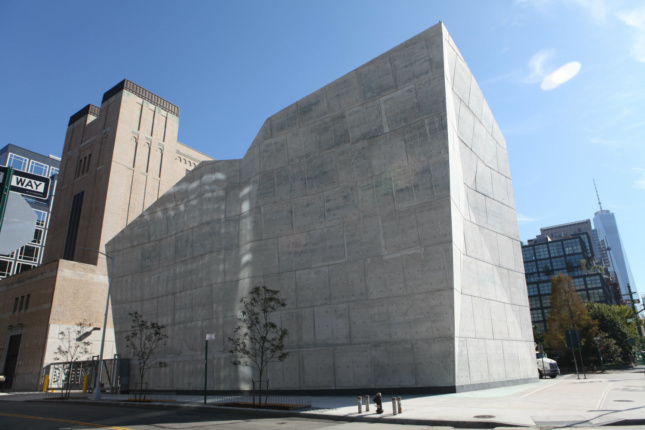 Across the street from the garage is the Salt Shed, which holds 5,000 tons of salt used to keep New York’s streets clear in the winter. It is one of 36 facilities throughout New York City meant to hold de-icing salt. The building is designed to resemble a lump of crystallized salt, with a 32-degree angle on the roof—salt’s natural angle of repose. 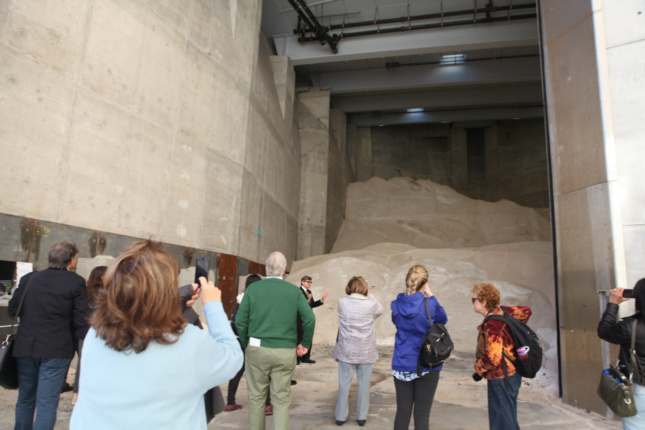 Salt in the Salt Shed reaches a height of roughly 45 feet and is refilled by trucks as needed in the winter. The structure is currently a grayish-white color, but slag mixed into the concrete means that it will change colors as the building ages. At night, architectural lighting lights the building in a magnificent way and it has become akin to a sculpture of the neighborhood. In fact, as we were on the tour, there was a photoshoot in front—not the first according to our guides. Quite a creative use for a building filled with tons and tons of salt. Tomorrow, we head to Horizon Media. About the author: Julia Christie is the Office Manager at AIANY / Center for Architecture.